My child loves animals, any type of animal for that matter. Whenever I have an opportunity to incorporate a lesson in Spanish on something that he loves, I literally jump on it! What better way to teach your child new vocabulary words on a subject that your child loves, and in a language that he’s learning? Open Wide the World creates wonderful units for dual language learners, and I’ll also be sharing with you Spanish children’s book about penguins. Disclosure: I received a complimentary copy for the purpose of reviewing it. I did not receive monetary compensation for this review. All opinions are my own. This post also contains an affiliate link (through Amazon). If you click on it, and make a purchase I will receive a small monetary compensation. 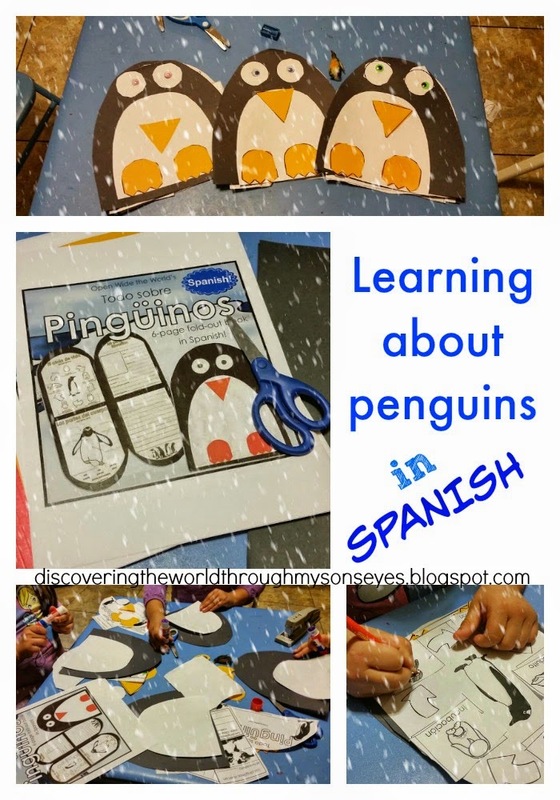 Before we say good-bye to Winter (and anything associated with that season including penguins, you know cold/penguins) I’ll be sharing with you my thoughts on the customizable penguin craftivity that I had the opportunity to review with my child, and his Spanish playgroup. Note to self: The craftivity requires a 12”x 18” black construction paper for the outer penguin folder. Unfortunately, I had not “fully” read the instructions, and went on to start the lesson with three eager kids with standard size black construction paper. I must read all of the instructions before I laid out all the fun things to do with the kiddos! The kids were so excited that I didn’t want to postpone our penguin lesson so we made them with the construction paper that we had. This wonderful Spanish Los Pingüinos Penguins Craftivity Booklet includes a flip book, covering the basic penguin habitat, glossary words, penguin chart with 17 species, a cut-and-paste of the life cycle of the penguin, labeling of the parts of a penguin, and a recording sheet, open-ended writing sheet, and more awesome fun stuff! You can see the details of the packet here. Don’t forget to check-out these great Spanish finds for your kiddos. Thank you Open Wide the World for allowing me to review your penguin unit. Previous Post: Tru-Colour Bandages – Bandages for Every Kid or Adult!